And that's 10 in a row for the Owls! 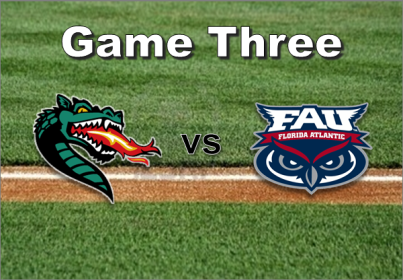 FAU has clinched the series against UAB in 2, and look to go for the sweep as they head into Sunday's game at 1:00pm. What a second half of the month it's been for the Owls, who've now won TEN STRAIGHT! FAU will go for the SWEEP over the Blazers tomorrow at 1 PM. Florida Atlantic University baseball, for the second straight week, clinched a Conference USA set with a Saturday win, and will look for a series sweep again after topping UAB, 6-2. Saturday also marked the Owls' 10th straight victory, a plateau not reached since 11 consecutive wins in 2013. The Owls opened the scoring in the second inning with an RBI double from Joe Montes, which brought home Pedro Pages from second after the catcher singled to right for FAU's first hit of the day. Later in the same inning, the Owls loaded the bases just to hit into a inning-ending double play immediately after. Andru Summerall had a 3 RBI day, which included a sac-fly in the third with runners on the corners. They fly-out to right field allowed Eric Rivera to plate FAU's second run of the day. Still, the Owls were unfortunate to only get one run as the visitors had one out with two on when Pages hit into the second inning-ending double play in as many innings. "Offensively, we did enough. 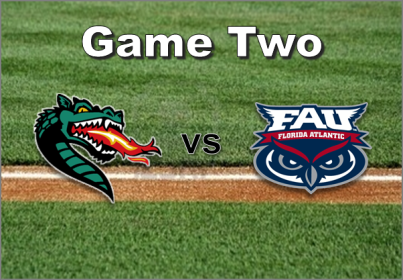 Early, we had a ton of chances, and credit to UAB, they turned a couple of double plays to get them out of it," noted FAU Head Coach John McCormack. With a 2-0 FAU lead, UAB began the fifth getting a double and a walk, and advancing both into scoring position with just one out. The Blazers got on the board with a sacrifice fly, but Mike Ruff bore down for a groundout to keep the one-run edge. FAU tacked on with a sac fly of their own in the sixth, and Ruff stranded a one-out walk with two strikeouts to wrap his final inning of work in the home half. Ruff scattered four hits in his six innings of work. He struck out seven, two off his career high. "Fantastic game by Mike Ruff, really impressive the way he threw," said McCormack, who moved Ruff from the Sunday SP slot to Saturday's last week against Rice. "He was able to keep the ball down, threw his secondary pitch for strikes, kept them off-balance, and his velocity was good all through the game." The Owls got cushion with a three-run seventh, with all of the scoring coming with two outs. Summerall laced a double to right-center to plate two, and Pedro Pages followed up by knocking Summerall in with an opposite-field single. Dylan Carter was great in relief, earning a three-out save and giving the Owls a chance for a Sunday sweep. The finale Sunday begins at 1 p.m. Eastern. It'll be Nick Swan starting for FAU against UAB's Tyler Gates. Coach mac has the guys playing superb. And he has figured out the pitchers. Great job by all the arms during this win streak. A five-run fifth inning for UAB proved to be the downfall Sunday for Florida Atlantic University baseball, falling 6-5 in the finale from Regions Field and snapping a 10-game winning streak for the Owls. The Owls (16-8, 5-1) led 2-1 heading to the bottom of the fifth, but UAB sent 11 batters to the plate in the decisive inning, scoring five runs on just three hits, taking advantage of three walks, a hit batter and an error. FAU chipped away, scoring once in the sixth and twice more in the eighth to cut it to one. In the latter inning, Francisco Urbaez doubled to lead things off, and came in on Andru Summerall’s third double in as many at-bats. Pedro Pages followed with a run-scoring single, but would be stranded after three consecutive outs. In the ninth, pinch-hitter Mitchell Hartigan drew a leadoff walk, again representing the tying run, but a double play by the Blazers Blazer (11-14, 1-5) erased him, and a popout ended the comeback attempt. Next up is a Wednesday matchup at FAU Baseball Stadium, with the Owls hosting Miami at 6:30 p.m.